Memory for managed code is handled by the garbage collector, but if you use any kind of unmanaged code, like native resources of any kind, open files, streams and window handles, your application may leak memory if these are not properly handled. To handle such resources the classes that own these in your application should implement the IDisposable interface, and preferably implement it according to the pattern described for that interface. When you suspect a memory leak, the immediate impulse would be to start up a memory profiler and start digging into that. However, before you follow that impulse, do a Static Code Analysis run with a ruleset tuned to finding possible memory leaks in your code. If you get any warnings from this, fix them before you go on with the profiling. 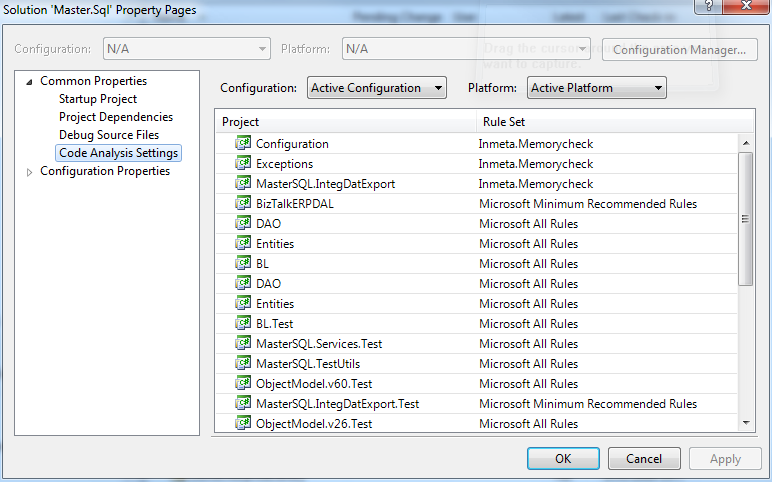 In this dialog you can now choose the Memorycheck ruleset for every project you want to investigate. Pressing Apply or Ok opens every project file and changes the projects code analysis ruleset to the one we have specified here. Change the Group By box to ID, and select the checks you want to include from the lists below. Note that you can change the action for each check to either warning, error or none, none being the same as unchecking the check. Now go to the properties window and set a new name and description for your ruleset. Then save (File/Save as) the ruleset using the new name as its name, and use it for your projects as detailed above. It can also be wise to add the ruleset to your solution as a solution item. That way it’s there if you want to enable Code Analysis in some of your TFS builds. In Visual Studio Dev-11 it is all much simpler, just go to the Solution root in the Solution explorer, right click and choose “Run code analysis on solution”. The following list is the essential and critical memory checks. The list below is a set of optional checks that may be enabled for your ruleset, because the issues these points too often happen as a result of attempting to fix up the warnings from the first set. I have defined three rulesets, one called Inmeta.Memorycheck with the rules in the first list above, and Inmeta.Memorycheck.Optionals containing the rules in the second list, and the last one called Inmeta.Memorycheck.All containing the sum of the two first ones. All three rulesets can be found in the zip archive “Inmeta.Memorycheck” downloadable from here.